We are repeatedly asked about the universal perfect super bass, which transmits from 8 Hz. Therefore I have written the following article as a basis for discussion of low bass with high impulse fidelity. The frequencies are determined by simulation is calculated. On another page we describe how to design a high-end subwoofer. The stronger the magnet, the tighter the bass, the greater the power of the cone. However the resonance is less pronounced and the low frequency range is raised less. First, the physical limits, using the example of a closed woofer, i.e. one-sided radiating cone (in the example the data of 2 pieces Alcone AC12 SW-8 are preset). For a low bass the woofer needs a big cone area and high excursion. You can try this out yourself by entering the following data: (The sound pressure is of course only reached if the loudspeaker is also capable of handling the electrical power). Copyright © Iris Strassacker, 2004. All rights reserved - Warranty excluded. Unfortunately, this formula results in quite high maximum efficiencies, which can rarely be achieved, so that we skip an evaluation. Optimally matched bass reflex solutions produce a maximum sound pressure level about 4 dB higher than that of the closed cabinet, which is also indicated by the computer above. 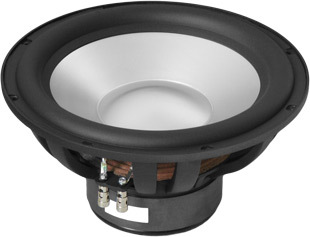 Wavecor SW310 WA02 is a 30 cm bass driver with aluminium cone. It is well suited for low bass reproduction. With 27.5 Hz resonance frequency in non-installed state it generates depths from 26 Hz (-8 dB) in 41 litres closed volume or in a bass reflex cabinet of 160 litres depths from approx. 16 Hz (-8dB). 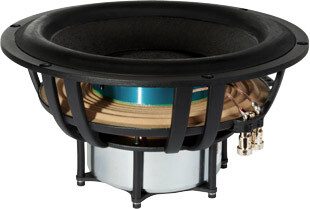 Morel UW 1258 is a 29 cm bass driver with paper cone. It ha a 130 mm diameter voice coil. The resonant frequency is 21 Hz when not installed. In a closed cabinet with a volume of 46 litres it plays from approx. 25 Hz (-8 dB). In a 180 litre bass reflex cabinet from about 16 Hz (-8 dB). Large cones do not move at all points in phase; the outer part is lagging behind. Therefore, several small ones are preferable. Due to their larger surface area, the lower notes emit the environment much more easily than expected. Unfortunately, this almost does not take into account any simulation program available to us.